We have just produced and published the #infographic for June, and it reports a crazy movement in the market. For regular readers of the Tallahassee real estate blog, you know that we have been tracking a market irregularity since February of this year. We have observed that the number of new contracts being written each month is on a significant decline, yet the number of closed home sales has not really followed suit. In other words, we are not seeing many new contracts, yet closings are still happening. 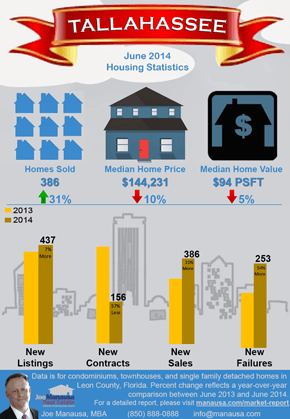 The new Tallahassee infographic is a available for download (just click on the image to the right). It has been saved in a handy .pdf format and provides a current picture of the Tallahassee real estate market. The gold bars in the infographic reveals some disconcerting trends. More homes came onto the market in June 2014 than we saw in June 2013, and more homes left the market as failures (homes that failed to sell) than we saw a year ago. New contracts were down 57%, meaning the number of new pending and contingent contracts posted in the Tallahassee MLS feel significantly (again) for the 5th consecutive month. Yet the number of closings rebounded 31% in June 2014 versus June 2013. The median home price fell 10% to $144,231 while the median home value fell 5% to $94 per square foot. The last several Housing Statistics Reports has shown a continued trend of rising inventory and falling home values. The surge in closings last month was a spot of good news in what has been several weak housing reports posted for the Summer. So the spotlight is on buyer activity for the next few months. Will contracts continue to decline? Will this have an impact on closings (it must, right?). Many real estate professionals in Florida are reporting low inventory levels, and that is good news for Tallahassee home sellers. We typically trail the rest of the State by more than a year, so perhaps we'll soon enjoy buyer activity like "everyone else." But sellers must prepare. If current trends continue, there will still be far more homes than homebuyers in 2015. I recommend people thinking about selling a home in Tallahassee just keep a close eye on each monthly Tallahassee Infographic, and of course if you're ready to move now, just drop me a note and we'll prepare a professional evaluation of your home in order to help you evaluate all of your options.